European migrants arriving in Australia before World War Two found that the easiest way to make a good life was to blend in as best they could. Many changed their names, simplifying and Anglicising their ‘difficult’ spellings and pronunciations, modifying their dress and behaviour to be accepted into a very constrained and compliant society. Russian immigrant Danila Vassilieff did nothing of the kind, instead playing up his exotic origins and relishing in being the outsider. In 1936 he was not just a colourful foreigner, but some energised being from another far more exciting and magical world. He drew on his Cossack heritage and tales, both real and imaginary, of a heroic past and he attracted followers among the younger artists yearning for some colour and excitement in their lives. He loved the company of young women and used his charm and style to openly woo those who caught his eye. He went cane farming in North Queensland and did engineering work on dam projects out of Sydney before moving on to Melbourne. He was a prolific painter, but there were few buyers for his quirky portraits and lively street scenes of the grimy inner suburbs. Vassilieff worked with the cheapest materials, painting on reclaimed boards, especially the plywood panels that could be prised from old tea chests. He had to work economically, for during the depression there were few who could buy art of any sort, and even fewer ready to buy vigorous modern works that the conservative art world saw as slapdash and childlike. Nearly all of Vassilieff’s work prior to 1939 depicts the street life and people, especially the children, of the inner suburban streets and lanes crammed onto the flat plain immediately to the east of the city. Melbourne’s geography has two distinct geological areas that are close in distance but very different in character. The west, north and inner east sits on a volcanic plain that spread eastward until it was stopped by a substantial cliff forming the edge of the older sandstone hills to the east. This clear divide, marked by the Yarra River, created a social division that was as distinct as the geology. On the plain thousands of workers lived in tiny terrace houses, all a short walk from the myriad factories that governed their working lives. Across the river on the hills lived the wealthy owners of those factories and those who derived their wealth in the city beyond. Large Victorian mansions rose in lush gardens along quiet streets where many lived lives unimaginable to those less than a mile away across the river. It seems that just once, Vassilieff took a tram and crossed the river to explore this other world. He may have walked along Isabella Grove and paused at the corner of Shakespeare Grove, or perhaps followed Coppin Grove that loops around to join it at the bottom of the hill. 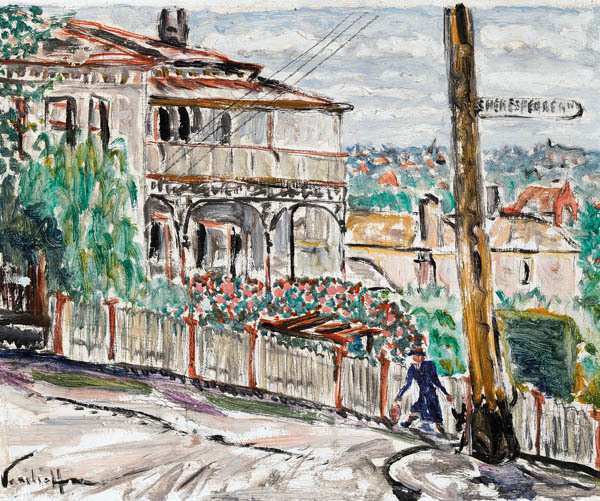 He painted the intersection and the houses beyond as he saw it, a place that remains remarkably similar today. The scene was sufficiently different to his usual work that he took the trouble to include the street sign identifying the corner, something he appears not to have done in his many pictures of the streets to the west. Rather than the usual swarm of inquisitive children a lone woman strides confidently along, accompanied by a dog. He appears never to have returned to Hawthorn and soon after moved out of town to his new home, Stonygrad, on the Yarra at Warrandyte. Vassilieff’s magnetic personality and open charm attracted the more relaxed residents of Warrandyte and he became a popular figure about the village. Helen Aron, the widow of a Melbourne property developer, had commissioned a new house to be built on top of a high hill north of the river, immediately above Stonygrad and Koornong, the school where Vassilieff had found work as a teacher. Helen soon met her neighbour and was drawn to the charm and vibrancy of his paintings. She supported many of the local painters, buying works by Adrian Lawlor, Jo Sweatman and Arnold Shore as well as Danila Vassilieff. She purchased two of his Fitzroy paintings, but was also attracted to the painting of Hawthorn, a quiet complement to the bustle of the other two pictures. The work has remained in her family’s collection since its initial purchase in 1940.